Home / The Buzz / 2 super special sausages! 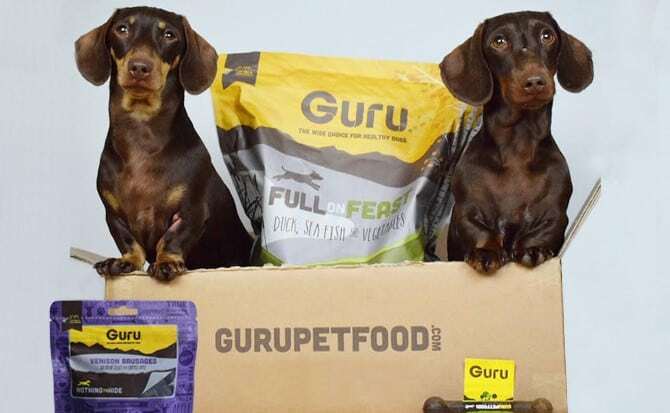 Before I begin to tell you our journey of how we became Geeksters, I would just like to say that we chose for the dogs to start eating Guru Pet Food and this is a completely honest opinion of the food and the company itself! 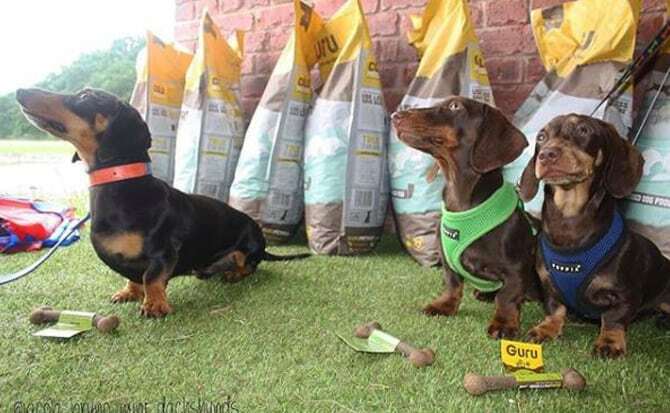 We first made contact with Guru Pet Food back when the dogs Instagram account was nearing 5000 followers (seems such a long time ago!). We asked them if they would like to take part in our first ever giveaway. We had seen their name pop up a few times on other dogs pages and we were really intrigued by their bright colours and their quirky appearance. We received a message back from them and we couldn’t believe how friendly they were, even though we hadn’t even spoken before! I guess this is where our love for Guru stemmed from. In the weeks after our competition, we started to interact with them on Instagram a lot more. We got to learn a bit about the food itself and started to see pictures of dogs enjoying their Trip Bones, especially on a Tuesday! At this time, it was getting towards the summer and we noticed Guru upload a picture talking about Dog Fest. Being quite new to the dog festival scene, we asked Guru for some more information on what Dog Fest actually was. Obviously, they were happy to tell us about it and explained they were going to have a brand NEW stall there this year. Jay and I both agreed it would be a great idea to attend that year and meet the Geeskters behind the Guru! The day for Dog Fest came one sunny day in June and we couldn’t be more excited to go to our first dog festival with the boys and also visit the Guru Pet Food stand. We had been speaking previously with Lisa, the co-owner of Guru Pet Food and were so impressed at how involved she was with all the dogs on Instagram and how much thought she had put in to the day. They were going to have a chalk board with the times the Insta dogs were going to be at their stand and pictures too! How cool! We just couldn’t wait to meet them. We were walking up to the entrance of Dogfest and noticed there stall instantly! It was MASSIVE. Big letters spelt out GURU and we could see the stand crowded with dogs and their owners. The one thing that stood out the most was the friendly staff all wearing yellow t-shirts with a small pair of black geek glasses printed on the front. We bee-lined over to the stall and bumped into a super lovely man called Andrew (Lisa’s husband and co-owner). He then took us over to a bubbly blonde lady… It was Lisa! She instantly recognised the boys and was over the moon that we had stopped. Being Instagram dogs, there were plenty of picture opportunities. The stall was fantastically designed with their products on display, retro seating for tired pups and owners, pictures of all their insta dog followers and a massive card board instagram picture cut out. So impressive! This is where we got to learn about the food itself. Lisa explained that the food was cold pressed, meaning that the food locked in all of the goodness which were all good for growth, digestion and health. This also meant that you could feed your dog up to 33% less than standard extruded kibble… Amazing! To be honest, we were won over by how nice Lisa was and the incredible stand they had, so this information was an added bonus. We took a 5kg bag of their Surf and Turf range and a couple of trip bones home with us to try them out. We didn’t actually get round to feeding the boys Guru until quite recently. The only reason being that we had already pre paid in bulk for their previous pet food, so needed to wait until we had finished that before moving on… We would have started the boys on Guru the day we met them if we could. You could call us tight arses! Since Dogfest we continued to keep in contact with Guru and saw their business grow and grow. We were not surprised as the passion that everyone had working for them really shone through. Everyone was friendly and you really felt valued. It was obvious a lot of time and effort had gone into creating this brand. When the time was right, we fully converted over to Guru. We were so delighted to be doing so and when we messaged them again, Lisa was equally excited for us to be joining. She made it incredibly easy for us to transition the boys over from their previous food to them. She explained everything and we even went on the website to take a look at their GURUvy feeding guide. The website was packed with the information you needed. We will write another blog about how the boys have got on with eating Guru, but we firstly wanted to let people know how amazing they all are. We interact with them on a daily basis, whether that be watching them take on a food challenge each week or see all of the other happy dogs that are now fully fledged Geeksters. The whole team at Guru are extremely friendly (have I mentioned that yet?). It’s clear to see they all enjoy working there and make you want to be part of the family. 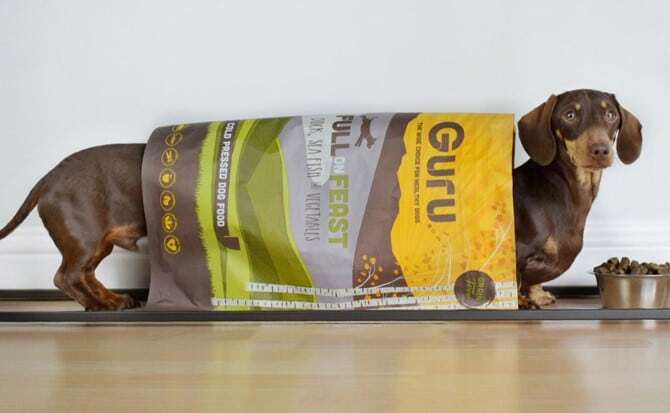 Guru aren’t just your normal pet food company, they have thought of everything, they’re modern, they’re approachable, they’re good fun, they care and most of all, their food is ace. We are so glad to have met the lovely people of Guru and know we have made the right decision with moving the boys onto their food. We are excited for more adventures and good times to come, it’s just a shame they live so far away! As mentioned, we will write another blog soon on how the boys get on eating their food and which food/treats they enjoy the most. 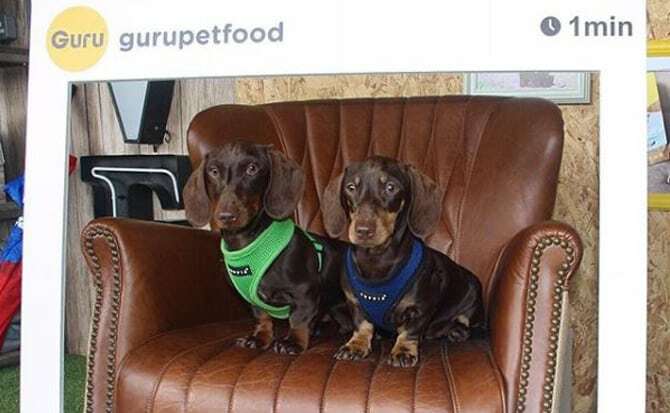 The Dachshund brothers from the Surrey Hills.